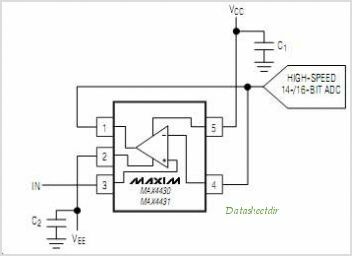 The MAX4430 MAX4431 single and MAX4432 MAX4433 dual Operational Amplifiers feature wide bandwidth, 16-bit settling times in 37ns, and low-noise/low-distortion operation. The MAX4430 MAX4432 are compensated for unity gain stability and have a small signal -3dB bandwidth of 180MHz. The MAX4431 MAX4433 are compensated for closed-loop gains of +2 or greater and have a small-signal -3dB bandwidth of 215MHz. The MAX4430 MAX4433 op amps require only 11mA of supply current per Amplifier while achieving 125dB open-loop gain. Voltage noise density is a low 2.8nV/Hz, and provides 100dB spurious-free dynamic range (SFDR) at 1MHz. These characteristics make these op amps ideal for driving modern high-speed 14- and 16-bit Analog-to-digital converters (ADCs). The MAX4430 MAX4431 are available in a space-saving 5-pin SOT23 package, and the MAX4432 MAX4433 are available in an 8-pin MAX package. This is one package pinout of MAX4430,If you need more pinouts please download MAX4430's pdf datasheet. This is one application circuit of MAX4430,If you need more circuits,please download MAX4430's pdf datasheet.